Social productivity – the way to go? 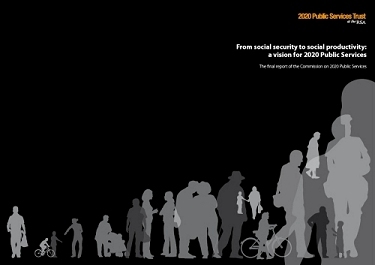 how our public services can respond to the significant challenges of the next decade. The Trust brought together a fair wodge of the (mainly metropolitan) great and the good around public services. Their final report was launched two days ago. I watched the part of the live feed from a sunny Scotland that bandwidth and BT didn’t freeze for me. Their conclusions in what for me is very much a curate’s egg of a report? We’ve reached what they call a moment of discontinuity with major costs looming of meeting the needs of an elderly population and abolishing child poverty. Public services as presently delivered can not deal with issues of inequality. Many “social outcomes” of those services are still disappointing. Public sector productivity has fallen over the last ten years. The Beveridge model has served Britain well but 60 years on, a reassessment of public services is needed. a new deal between citizen, society and the state (that) rejects both old statist models of universal service delivery and the new public management models of consumerism. Instead a new settlement for public services should be based on the principle of social citizenship. As citizens we should have a duty to contribute as well as a right to receive support – responsibility and reciprocity are essential characteristics of a more resilient society. They say, correctly, that some of this is already happening (it’s always been there) but needs to be encouraged. For that we need shifts in culture, power, and finance. local accountability should be encouraged so that reform has genuine local ownership and control. Interestingly, and despite political devolution, there’s not one reference to Scotland, Wales or Northern Ireland even though their public policy makers, not Westminster’s, have the major influence over local services. There’s some reasonable stuff here and those with a vested interest are already claiming the conclusions as their own – central government because of the Big Society (I wouldn’t be too sure if I were them) and local government because of the emphasis on local solutions (I definitely wouldn’t be too sure I were them). But you need to get past some of the convoluted language (“We would welcome introduction of a measurement framework that captures broader measures of social value as a catalyst for social productivity”). And despite the number of “commissioners” and the length of their deliberations some of the report veers towards what a former senior civil servant I know calls applehood and mother pie. The report doesn’t paint a practical picture of what public services might look like in 2020 and I find it difficult to visualise that. And there is absolutely no reference to other countries. Have we nothing to learn from New Zealand, the USA, Sweden, Australia, Germany, Japan or the BRIC countries?